Has anyone noticed pattern regarding which bones you receive? 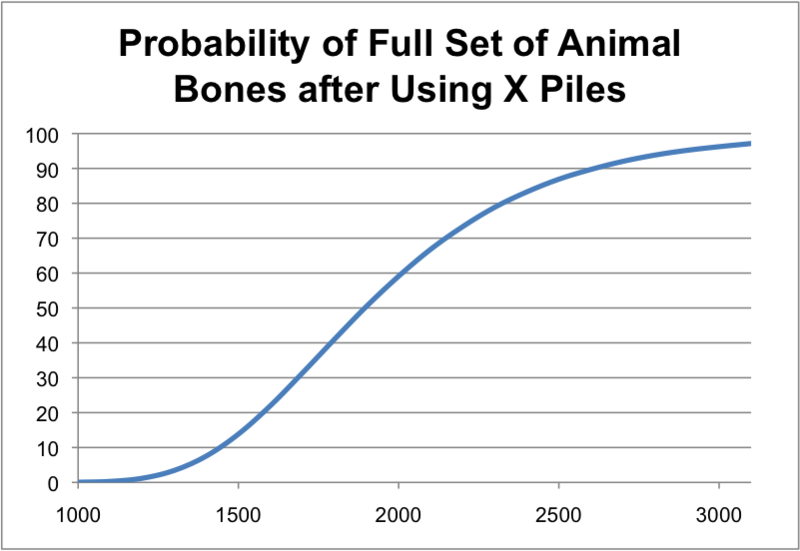 I'm thinking that the number of piles you use at once affects which pieces you compile? I used one alone, and it yielded a dusty third thoracic vertebra. It is not that it is a pattern, or that you need to use more than one. It is simply that it has a relatively low rate of getting you an item. You can combine the cranium and jawbone to create a skull that can be used. I'm hoping that will do the work for us. Appears as a seperate section in the Misc. inventory section. any chance that some of these turn into weapons? My wife was playing earlier and wanted to see what bones she needed, so I whipped up some junk java code and extracted the full list of bones from the wiki. This is all fairly sloppy, but I thought I'd post what I had in case it could help anyone out. Java source and text file for the list are available on my terrible blog thing. This page was last modified on 14 September 2014, at 20:19.